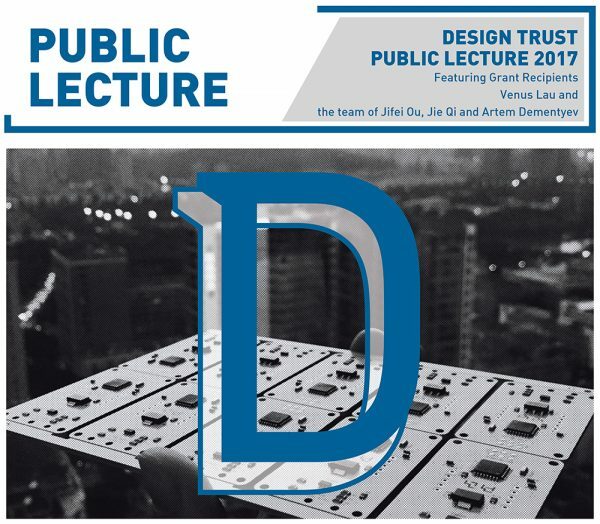 At the Design Trust Public Lecture 2017, two Design Trust Feature Grant Recipients –Venus Lau and the MIT Media Lab team of Jifei Ou, Jie Qi and Artem Dementyev – will present their Design Trust-funded projects. Venus Lau will introduce her project “Simon Denny: Real Mass Entrepreneurship”, the first solo exhibition in China of Berlin based Simon Denny, focusing on his in-depth research of Shenzhen’s tech-manufacturing. The exhibition was curated by Venus Lau and scenography/spatial design was done by architect Betty Ng. Exploring the idea of a “researcher in residency” in the context of manufacturing, the team of Jifei Ou, Jie Qi and Artem Dementyev will present their project “Hacking Manufacturing”. By bringing researchers to the factory floor in Shenzhen for four weeks, the team experiment methods to fuse the lab and factory as a future venue for innovation. To reserve your space, please RSVP by 16 Aug 2017 via THIS LINK. Seats are available on a limited basis and require a RSVP confirmation.